I must admit, this challenge is very challenging in more than one way. For example we are on Day 11 and sometimes I really have to stretch a bit to...come up with a title. The thought that I will have to come up with 19 more is a bit daunting. I may have to ask all of you who read this blog and my Facebook friends too for the occasional title. One of the wonderful things about using this challenge to make waves is that it is getting easier. I am starting to understand a bit more of the complexity. Not that it always comes out in the painting but the understanding and the seeing more is getting better. This painting was created from one of my studies. I wasn't happy with the study because when I got back home, the sand looked way too green. It was nice to be able to correct that. I struggled a bit with the globs of foam that the wind blew off the scud line. I remember being amused that they landed in fat blobs and proceeded to be slowly blown diagonally in these straight lines along the thin film of invisible water. They looked like fat white slugs going to a party. I still don't quite have it but hopefully the next time I see it happen, I will get it down. Speaking of seeing things happen, it has been a while since I have been able to get out to the beach. The weather has been very cold and with a bit of wind, specially with the moist winds we get, it becomes bitterly cold. I don't have the gear for that. I could paint in my car but it is challenging for me to sit for long. My back was just starting to recover from the long unexpected trip in the car we had to make when I slipped and fell the other day, rather hard. My back is not happy. It will heal. On the positive side, I got the new canvas I plan to use for my wave studies instead of the homemade hemp ones I was using. It is thicker and smoother. I will have plenty for quite a while. I am hoping the bitter cold will leave us soon and we will be back to our usual cold gray weather. I definitely need to get out. I only have about two more wave studies that I feel worthwhile to make into finished paintings! I am thinking I would like to expand my wave studies now to begin to include a bit of the rock formations around here. They are quite spectacular and some are even iconic. I will continue to improve my waves even so. On to the next day's challenge! 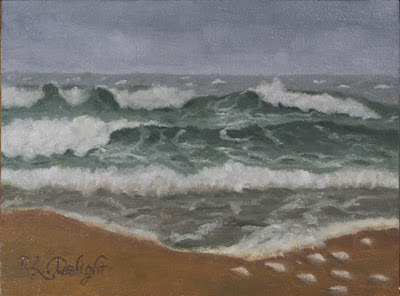 I'm loving seeing your challenge paintings and I am partial to the coast so the subject matter is great.